Start your day at St Pancras International where you will meet a Golden Tours representative at the Chop’d coffee shop, opposite the Eurostar concourse. Please arrive at 6.00am (5.30am on Saturdays) to pick up your welcome pack for your Parisian adventure. Be sure to allow yourself plenty of time as check in closes 30 minutes before the train departure time. Once you’ve boarded your Eurostar train, you can sit back and relax all the way to Gare du Nord station! Discover Paris at your own leisure with a whole day to do as you please. Maybe you want to see Leonardo Da Vinci’s world-famous masterpiece, the Mona Lisa, at the Louvre, or climb to the top of the Eiffel Tower. Have time to visit the terrifying Catacombs or spend time shopping along the many iconic designer shops on the Champs-Élysées. 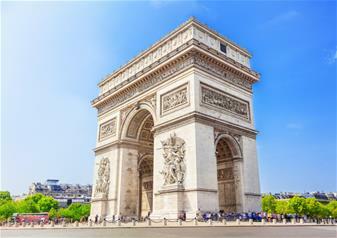 Soak in sensational views of Paris as you embark on a cruise along the River Seine. Taking you past some of the city’s most famous sights, it’s a sightseeing experience that you’ll never forget. When your day trip to Paris comes to an end, make your way back to Gare du Nord at least 45 minutes before your departure time. Departure time is 8.13pm which gets you back into London at 9.29pm.